Jordan Howard could bring the inside running push Eagles fans have been hoping for. “Rugged, physical. Definitely setting the tone...I feel like I’m a blue-collar player and I feel like this is a blue-collar city," Howard said when describing his running style. Jordan Howard could have preempted much talk radio hand-wringing, could have saved Eagles fans quite a bit of angst. Asked how long he had known this, Howard said: "Probably for like a month." Howard said the trading block was a lonely place to linger. “I was getting tired of everybody hitting me up about, like, ‘Are you being traded?’ ‘How do you feel about this?’ So I was definitely relieved,” he said, when the deal for a conditional 2020 draft pick was announced on Friday. The Eagles were often mentioned as a potential destination, mostly because the 2016 draft, in which Howard was a Bears fifth-round selection, was the last thing Joe Douglas did there before coming to Philadelphia as player personnel vice president. But the trade hardly seemed inevitable; for one thing, the Eagles were closely linked to running back Tevin Coleman before the Atlanta free agent signed in San Francisco. But Howard said his agent, Adisa Bakari, told him he would be an Eagle. Interestingly enough, Bakari also represents Coleman. After Coleman didn’t become an Eagle and no other free agent move was immediately forthcoming, some fans obsessed over whether Howie Roseman respected the running back position enough. Howard is listed at 6 feet, 224 pounds and ought to be able to provide the inside running push Eagles fans value. Howard said he met with Eagles running backs coach Duce Staley before that 2016 draft, in which the Bears took Howard three slots before the Eagles drafted Wendell Smallwood. Jordan Howard saw his role gradually decrease in Chicago following his Pro Bowl-caliber rookie season. Pro Football Focus gave Howard a 98.7 grade in pass blocking efficiency last season, a better mark than it gave any Eagles back. The Bears didn’t consider Howard a dynamic back, and his role in the offense began to decline almost from the arrival of 2017 draftee Tarik Cohen. Howard said Monday he had no explanation for that or for why his yards per carry declined each season, from 5.2 to 4.1 to 3.7. “They made a decision, they wanted to move on. I can’t be mad at that or have hard feelings about that,” he said. That year, “I had a lot of success, but we only won three games,” he said. Howard, entering the final season of his rookie contract, said he hasn’t talked to any coaches about his role. The Eagles still could draft a running back this year. They have Corey Clement rehabbing a torn ACL, 2018 undrafted rookie Josh Adams, and Smallwood. More to the point, no running back is ever going to pile up a ton of carries in Doug Pederson’s offense. 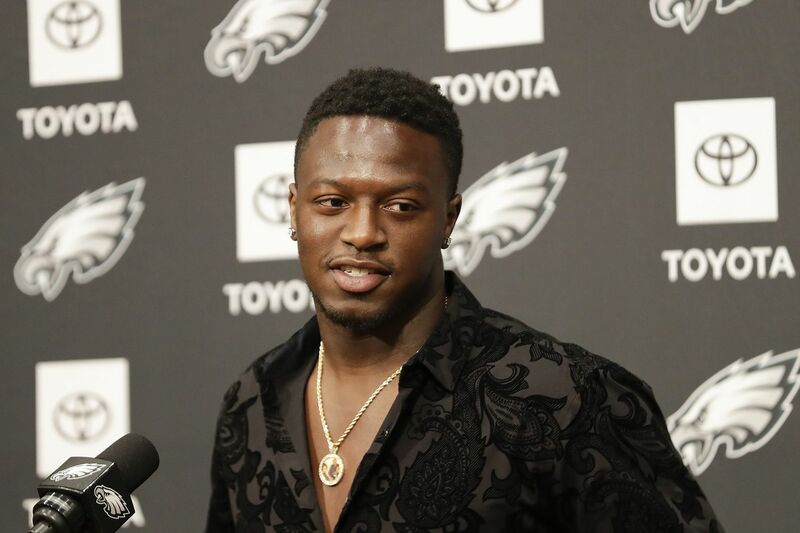 Howard said he has a definite impression of the Eagles, who have held him to 63 yards on 20 carries in three meetings, including this past season’s playoff game. Did Howard study up on his new team, while he was waiting for the trade?